Why isn’t there a statutory penalty against politicians lying to the public? 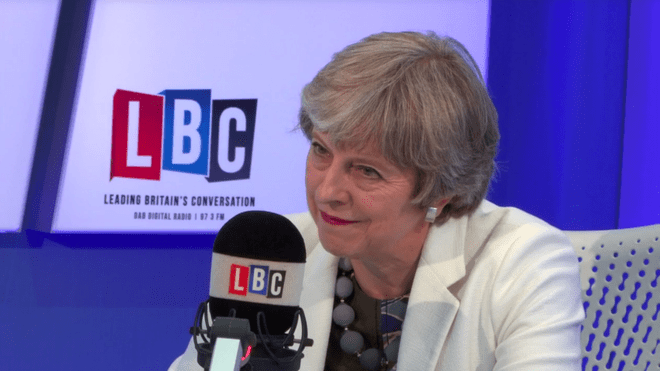 Liar: Theresa May told Tory-supporting 17-year-old Calum that taxpayers would support students who would become better-paid, under Labour’s plan to axe tuition fees. But everybody benefits from having well-educated professionals, and there would have been no increase in taxes for the low-paid. Peter Stefanovic makes a good point (in fact, he’s probably re-stating it, as the Tory penchant for lying to us is well-documented). The answer to the question in the headline is obvious, though – there isn’t a statutory penalty for politicians lying to the pubic because politicians would have to impose it, and they all know they’re going to want to lie to us at one time or another (with the possible exception of Jeremy Corbyn). So they lie, and lie, and lie again, and hope that we won’t remember by the time the next election comes around. That’s why it is our responsibility – those of us who operate within the social media – to record these instances, follow their consequences, and remind the wider world at the necessary time. Are you having a laugh or just expressing a London centric view. Corbyn has lied to Scotland on numerous occasions. Here is just a few, all within 20 seconds from one interview. – “The SNP are privatising CalMac.” – “The SNP were behind privatisation of ScotRail.” – “the SNP are also cutting college places” – “[they’re] also cutting local government funding”. On his last visit to Scotland in August he promised to come up every month. Still waiting! If Jeremy Corbyn wants to win back voters in Scotland, readers might feel that telling them a pack of casual lies probably isn’t the smartest way to go about it. That’s the strategy Scottish Labour has adopted ever since 2007, and it doesn’t seem to be going terribly well. I’d find it easier to believe your comment if you had provided proof to back up your statements about Mr Corbyn. We live in a country where politicians come out with any old tripe and expect to be believed, without having to provide evidence – that was my assertion. And then you come back with a lot of wild assertions about Mr Corbyn and expect to be believed, without having to provide evidence. Can you see how silly that makes you seem? More to the point why aren’t our so called fair and unbiased media not calling out politicians on all sides to justify or even prove their points. The ability of populists to get away with stating unsubstantiated opinion as fact, a la Farage in almost everything he said, went largely unchallenged. If politicians know they’re going to have to back up their flannel with hard, indisputable facts then perhaps debate could return to the realms of reality rather than the “it’s true because I say so” School of discussion. At this moment a politician can make almost any claim and the ill informed nodding dog facing them across the studio just smiles and moves on to the next scripted question, the answer to which they will again fail to understand or probe for veracity. Will the Churchill family be surcharges for the times he lied in WW2? Will Cameron be charged for lying about the great deal he got form the eu prior to the lies when the referendum was enacted? Why isn’t there a penalty against the DWP if the claimant is left for months without UC payments? Tories = lies and corruption. The problem is that too many people have forgotten the lies when the next election comes round. Your point was completely ruined by the inference that Corbyn is the only politician who could be considered not prone to lying. Find a provable instance in which Mr Corbyn lied.